Forever Bee Pollen™ is gathered in specially-designed stainless steel collectors from the blossoms that blanket remote, high desert regions. This ensures the freshest and most potent natural food. 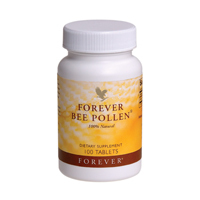 Forever Bee Pollen™ is all-natural and contains no preservatives, artificial colours or flavours. Bee Pollen has been found to contain a wide spectrum of trace nutrients. These include B-complex vitamins and vitamins, C, D, E, K, and Beta Carotene (vitamin A), plus numerous minerals, enzymes and coenzymes, plant-source fatty acids, carbohydrates, proteins, and amino acids – including 'essential' amino acids that the body cannot manufacture for itself. Bee Pollen is one of the most natural and complete foods available. Bee Pollen is readily digestable and easily absorbed by the human body. Research by scientists suggests that Bee Pollen may assist in maintaining a healthy circulatory, digestive, immune, and nervous system. Begin by taking 1/4 tablet daily, preferably before meals, then gradually increase intake to one tablet three times a day. Consult your physician before taking this or any other dietary supplement.